Aquatic therapy is a form of physical therapy patients participate in while being guided in performing rehabilitation exercises within a pool setting. Because aquatic therapy is a seemingly less intense form of therapy, it is often used with patients whose bodies are not yet ready for land therapy, or who are not responding well to other therapy programs. Buoyancy: Buoyancy in terms of water refers to the ability of a person or object to float or rise due to an upward force exerted by the water. This is one of the key concepts of aquatic therapy. Buoyancy reduces the amount of weight that a patient feels while in the water, making it easier for them to complete certain exercises. It also helps alleviate the pressure that traditional land therapy tends to put on joints and other problem areas such as the spine. 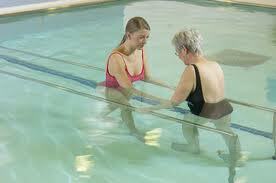 Studies have shown that buoyancy reduces strain and joint compression up to 75% during aquatic therapy. Because buoyancy helps to diminish several weight-bearing forces, aquatic therapy is a fan favorite, especially for those suffering with weight related issues. Temperature: The temperature of the water during aquatic therapy is also a major factor. Generally pool water temperatures are set at a minimum of 82 degrees and often even up to 88 degrees during aquatic therapy sessions. The warm water temperatures help to relax the muscles and improve the patient’s blood flow. This helps to reduce pain and makes for a more soothing environment for the patient. Resistance: Have you ever noticed how hard it is to walk inside a swimming pool? That is because of the resistance that the water provides. Although the concept of buoyancy makes your body feel as light as a feather, the force of the water is still powerful. In terms of aquatic therapy, this is a good thing because it provides an invisible barrier that your muscles are forced to work against. This so-called invisible barrier is just as effective as traditional weights and dumbbells in helping patients to regain strength and endurance. Hydrostatic Pressure: The hydrostatic pressure within the pool setting helps to reduce any swelling of the joints that patients may be experiencing. In addition it plays a huge role in the re-learning of balancing. The water pressure allows patients who suffer with balance issues to move more freely with very little assistance. Patients who are forced to use equipment such as walkers or canes will find that they can walk independently while in the water due to hydrostatic pressure. Aquatic physical therapy is offered at ourCreve Coeur location.For more information regarding aquatic therapy or to set up an appointment call us today at (314) 991-1978.